David R. Minerd was born on Nov. 15, 1864 at Rogers Mills, Fayette County, PA, the son of Joel and Catherine (Seneff) Minerd. He appears to have been named for an uncle, and if so, his middle name was "Rugg." David was a farmer and seems to have spent his entire 39 years of life in the area. He never married but appears to have endured a long battle with tuberculosis. In September 1895, the Connellsville Courier said he was "suffering from lung trouble," and the following spring said he "is worse again." Also in 1895, David is known to have "lost a valuable horse." An 1895 issue of the Courier boasted that "David Minerd wants the news and is therefore a subscriber for the Courier." 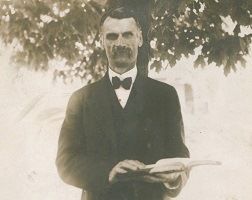 Active in church, David was elected librarian in 1900 of the Hillview Church Sunday School near Normalville. As his tuberculosis grew ever worse, David went to live with his parents. But there was no hope. On Dec. 6, 1903, at the age of 46, he died in their home. The Courier eulogized that he "had been ill for a number of years, suffering from consumption. His last illness, however, was of only a few weeks' duration. The funeral was held Tuesday and services were conducted by Rev. E.E. DeHaven and the remains interred in the old Seneff graveyard, near the deceased's late home."